Luxury Oceanfront House! Incredible See-Thru Walls! Magnificent luxury Gulf front single family house with intracoastal views. 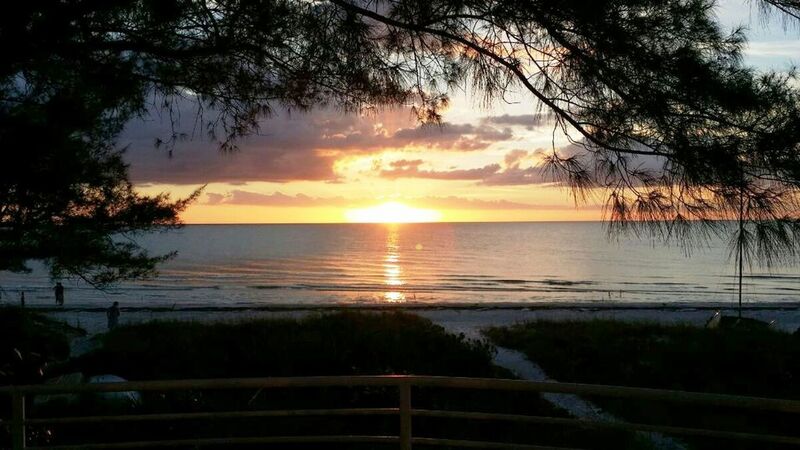 Directly on the sand of the Gulf of Mexico, this home is peaceful and private, yet one-half mile from the shops and restaurants of Indian Shores and Indian Rocks Beach. From the Gulf, use the outside shower and relax in the covered patio. Or walk out the front of your home and view the inland waterway. This home has all the water and sun you could ever desire. Expansive views are afforded from the great room, master bedroom, kitchen and dining room, with the added benefit of Intracoastal views from a further bedroom and its terrace. Downstairs is the large family room complete with wide screen TV and open to the fully equipped kitchen complete with Sub-Zero refrigerator. A bedroom with full bath completes the downstairs. Upstairs is the large master bedroom with a king sized sleep number bed, wide screen TV and an outside veranda the length of the home overlooking the Gulf. The third bedroom, upstairs, has a queen sized bed and a porch overlooking the tranquil inland waterway. The contemporary beach flair, with open plan living space, opens up to a terrace for al fresco dining and the beach garden is expansive enough for relaxing in the chaise lounges. This beautiful home is one of a kind on a stretch of beach so quiet is seems to be your own private beach. There is not another location anywhere like it. Guests rave about the house, calling it a "Dream House" and "Heaven on Earth". If your desire is to stay in your own private home, away from the crowds but close to shopping, restaurants and the Tampa airport, then this home is designed for you. You literally step off the back porch onto the sand. You can get no closer to the beach than our home. Full view of beach and ocean from this perfectly placed living room. Wide screen TV. Wide screen TV in both the living room and master bedroom. 5 lounge chairs for people watching on the beach. Boat rental just 2 miles away. Beach chairs, Umbrellas and all the digging tools a child could want on the beach. Brand new furniture throughout the house. Breezy open floor plan ideal for both relaxing and entertaining. Two stories of panoramic living--master bedroom overlooks the gulf and the family room flows directly onto the beach. Perfect honeymoon retreat--private, beautiful and exciting! This house is a great getaway right on the ocean. It has everything you need to have a relaxing vacation. The sunsets are amazing and the fishing is great. It is close to food and shopping. The property manager is fantastic. This was our 4th year there and we are already booked for next year. Beautiful and Clean home, unbelievable views out front and back doors! We wanted for nothing while we were there (except nice recliner chairs for the night time tv watching would have been over the top nice!) The Management staff Gabriel and Harmony are outstanding and efficient! We appreciate all the prior and arrival guidance/ instruction. We enjoyed side trips to Clearwater Beach, Largo, Madira Beach, Bush Gardens, Disney Springs and other nearby areas. So many nearby restaurants with outstanding food and service too! Ample outside chairs to use which we really appreciated. Neighbors are very close but all were quiet so not an issue for us, other than smelling their patio smoke breaks. We would not hesitate to come back to this Beach House again! Thank YOU! This was our second stay at this house and it was great. The house, view and location make it a great place to unwind. There was a small issue that came up our last couple days. We let the owner know and he took care of it quickly and with integrity. You really don't know who you are renting from until something happens. He went above and beyond taking care of the issue. Furthermore, the issue was completely fixed and we look forward to future stays at this great rental! You will not regret renting this house. We truly enjoyed our stay at the beach and this beach house. The views and access to beach are outstanding! Gabrielle and Harmony took pride in paying special attention to the house and property and its guests. We needed only our own personal gear and they took care of the rest, right down to the blender for the margaritas and chairs for the beach. Off road, attached garage was also a bonus. Items to just be aware of: The stove and oven are fickle and tricky. The road between the house and intercoastal can be congested, especially during certain times of the day and construction hours. Proximity to neighbors can make it loud in the evening,. Thanks for offering a great place to kick back and escape the snow and ice back home! Have been going down to Indian Shores for over 50 years and plan to reserve this great beach house again sometime soon. Walking distance to several bars and restaurants and beach level access to front yard. Its rare to have the ability to walk out your front door to a beautiful sunset without going down stairs or worse yet taking an elevator. Highly recommend this unit. Lovely beach front home with all the amenities. Gabrielle was an outstanding property manager that answered all questions. No Pets. Thanksgiving Week is $2425. $250 cancellation charge prior to 90 days from arrival. No refund within 90 days.